THE GRAND BUDAPEST HOTEL recounts the adventures of Gustave H, a legendary concierge at a famous European hotel between the wars; and Zero Moustafa, the lobby boy who becomes his most trusted friend. The story involves the theft and recovery of a priceless Renaissance painting; a raging battle for an enormous family fortune; a desperate chase on motorcycles, trains, sleds, and skis; and the sweetest confection of a love affair -- all against the back-drop of a suddenly and dramatically changing Continent. Download The Grand Budapest Hotel in Digital HD from the iTunes store. The Grand Budapest Hotel images are © Fox Searchlight Pictures. All Rights Reserved. Quirky and comical Wes Anderson's newest release The Grand Budapest Hotel follows the same pattern as several of his past work, but this one outdoes them all. The sets, special computer graphics, costumes and other production values take you to a whimsical world of mystery and murder as only Anderson can depict. If you are a fan of Wes Anderson's eight past films or at least The Royal Tenenbaums and The Darjeeling Limited then this mystery adventure will be a perfect fit. In my estimation The Grand Budapest Hotel is Wes Anderson's greatest adventure ever and reestablishes him as my favorite storyteller. He masterfully puts together a sequence of events that will keep you spellbound. His characters are interesting, no fascinating is the better word, and filled with conflicts. He uses the absurd to create laughter putting his actors in situations from preposterous to perilous. Adding the element of surprise he challenges his audience to accept what they have seen and then takes them on a roller coaster ride fleeing across a continent. The story opens with a young aspiring writer (Jude Law) grasping an opportunity to interview the owner of the charming Grand Budapest Hotel. As the man tells the 1930's story of this once glorious resort for the rich, he begins with M. Gustave (Ralph Fiennes) the most prominent concierge in Europe. Known throughout the continent, affluent visitors pack the resort and spa for its magnificent indulgences. Charismatic and crafty he has his guests eating out of the palm of his hand. So enchanting is M. Gustave that the ladies, no matter of age or looks, are treated to enjoyable pampering, mostly of the sexual kind. His most ostentatious and wealthy patron 84-year-old Madam D (Tilda Swinton) has been his prize visitor and she returns every year to enjoy life and ‘rejuvenate' her body. He buzzes around the elderly woman getting his staff to give their utmost attention to her needs. In the meantime, in need of a trustworthy lobby boy he hires Zero (Tony Revolori), a young emigrant looking to learn from the best in Europe. Taken by the boy's personality M. Gustave starts teaching him how to work with the guests and cultivates his loyalty to him. During this segment we get introduced to many of the characters that will be important to the story. Director and writer Wes Anderson moves his plot along and then gets the adventure rolling with a message from Deputy Kovacs (Jeff Goldblum) to M. Gustave that Madam D has died. The note commands him to attend the reading of her will. At the Kovacs' mansion the intimidating relatives, including her son Dmitri (Adrien Brody), are wary of the concierge they perceive as a philanderer. When M. Gustave gets awarded the priceless painting "Boy with Apple" and finds out that Madam D was murdered, a wild escapade of chase, a jail break, plotting, many antagonists, the secret society of the crossed keys and misfortune begins with his and Zero's life in the balance. The script has a lot of great lines for Wes Anderson's amazing cast made up of familiar names in acting. He uses his mainstays from his former films like The Darjeeling Limited (Owen Wilson, Adrien Brody, Jason Schwartzman, Bill Murray), Moonrise Kingdom (Edward Norton, Tilda Swinton, Bob Balaban, Harvey Keitel) and The Life Aquatic with Steve Zissou (Willem DaFoe, Jeff Goldblum, Waris Ahluwalia). He mixes in stars that are new to his productions featuring Ralph Fiennes, Tony Revolori, F. Murray Abraham, Mathieu Amalric and Jude Law, giving them a chance at a quirky romp around Europe during the 1940's. It's a lot of brilliance in one movie, yet Anderson works well with them controlling their performances so they can provide his signature film. In the lead as M. Gustave, Ralph Fiennes shows his wide range of talent in this comedic role. He molds his character into a flashy, winsome, pervasive and alluring person with tongue in cheek seriousness that embodies the spirit of M. Gustav. Known for his resolute performances in such films as Schindler's List and The English Patient, it's a refreshing turn for the great actor. A breakout role for Tony Revolori, his Zero really sets the tone of the film with a character that allows Fiennes to show his brilliance. He's not only the storyteller but the sidekick that provides the chemical balance that elicits the laughter and urgency needed to carry out the perilous adventure. Also in support Saoirse Ronan makes the perfect Agatha a pastry chef that finds herself drawn to Zero and the charismatic M. Gustave. She builds a lovable and reliable young woman who helps the two misfits find their way through a maze of wacky situations. 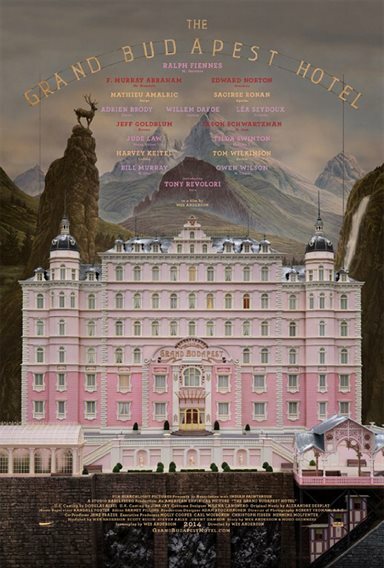 The CGI is stunning, especially the Grand Budapest Hotel with its pink facade, gaudy interiors and opulent facilities. From snow covered ski slopes to the foreboding interior of Madam D's funeral reception, everything looks real. The costuming/make-up puts viewers in the midst of the 30's Europe with the high collars, flapper hair styles and mustaches. The masterpiece of make-up however, is the transforming of Tilda Swinton into a gaunt 84-year-old Madam D. A team of artists create the aged woman using latex, prosthetic, globs of powder and face paint. So realistic, that when she talks and cajoles with M. Gustave, every face muscle moves from smile to frown. The Grand Budapest Hotel has been rated R for language, some sexual content and violence. Be cautious when deciding to allow immature children see the film as it does have some scenes that are very inappropriate for adolescents.